with about one-third ending in divorce. While these figures are still quite alarming for newlyweds and romantics, all is not lost – these rates have dropped since the 90s, when the peak of divorces caused by the more lenient rules of the Family Law Act 1975 started evening out. This law allowed married couples to divorce after only 12 months’ separation for ‘irretrievable breakdown’, rather than having to first endure five years of separation or prove fault with your ex-partner. • Less people are getting married to begin with. • Many more people are actually living together before marriage. • Less stigma on single parenting has decreased unsuitable ‘shotgun’ weddings. • The median age of couples entering marriage has increased (younger couples under 25 years tend to divorce more frequently). • Greater access to birth control has reduced the stress of too many children within a relationship. • A greater number of people entering tertiary education, which has been shown to decrease divorce rates. So if you do end up staring divorce in the face, don’t feel too bad – maybe you were just too young, had too many stressors (like an abundance of children, perhaps) or didn’t get the chance to ‘try before you buy’! 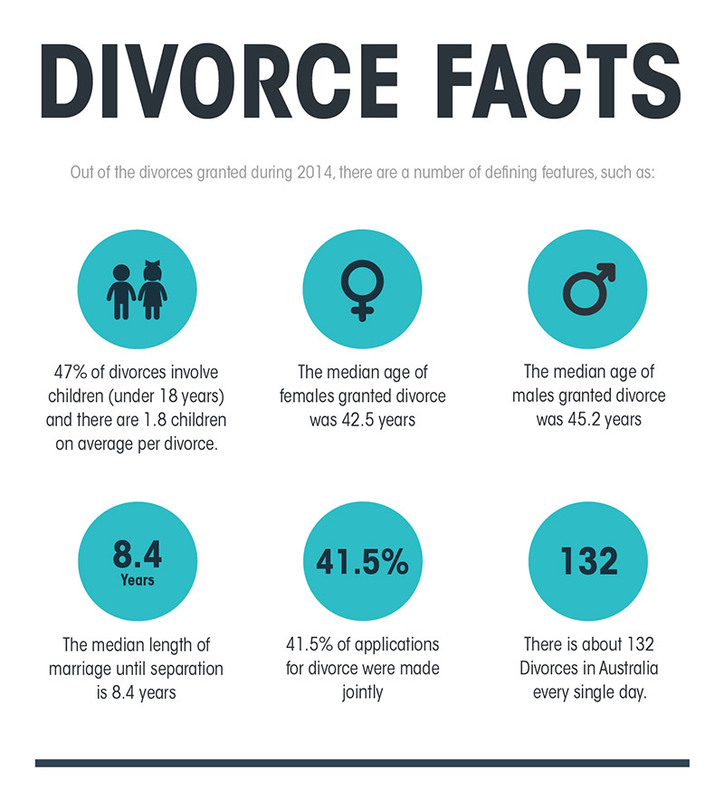 47% of divorces involve children (under 18 years) and there are 1.8 children on average per divorce. • Those getting married for the first time have a greater chance of staying together than those marrying for the second or third (or more) time. 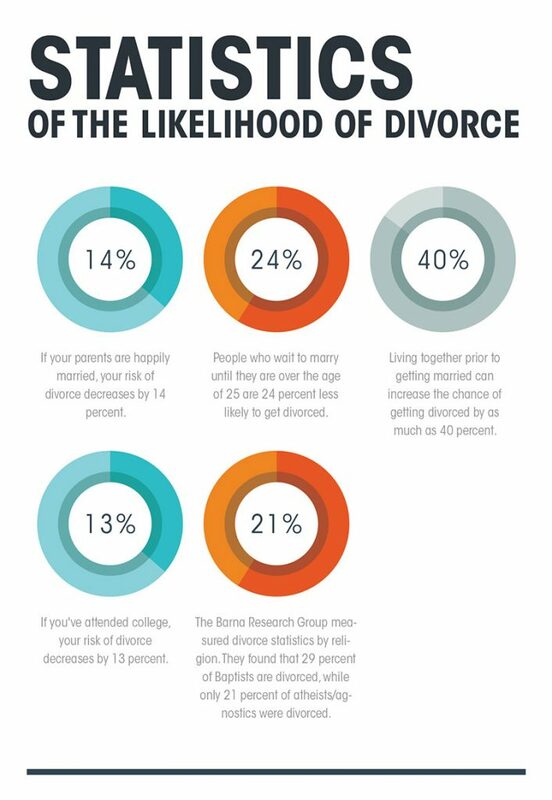 • Those with happily married parents are less likely to divorce themselves. • People who tend towards a left-wing political influence are less likely to divorce than those tending towards a right-wing political influence. • Atheists and agnostics are less likely to divorce. • Couples with children are less likely to divorce. 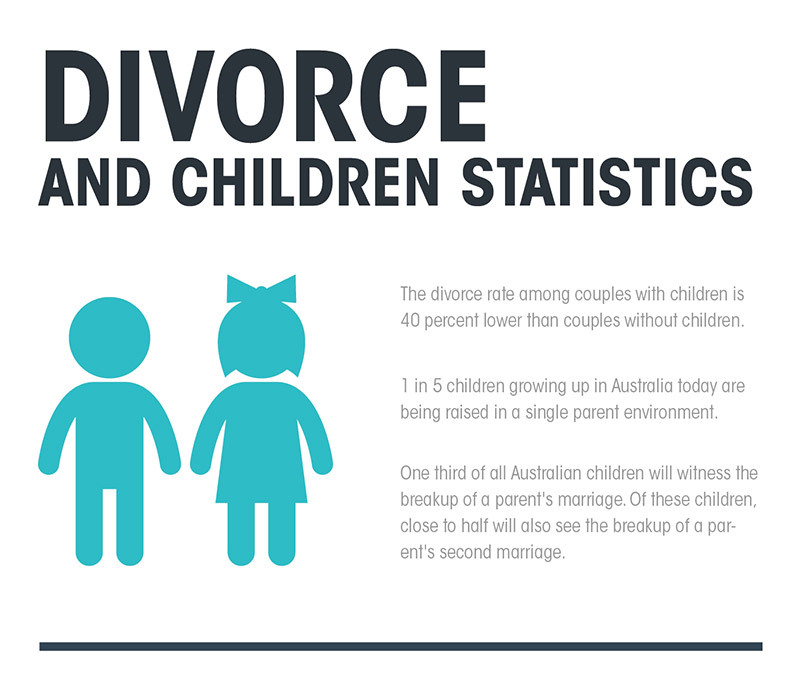 If you’re still dismayed at the divorce rate in Australia, it might surprise you to learn that a high divorce rate is a sign of a progressive society! That’s right – societies with a high divorce rate are generally those with increased women’s rights, a greater social network and acceptance for single parent families, as well as a society that doesn’t believe in their citizens suffering in unhappy marriages. The view on divorce has changed in today's modern world. It isn’t always as tragic as it may once have been perceived. Sure, you have to overcome the emotional aspect of the marriage ending but in many ways this can be a fresh start for all parties involved. Even the divorce proceedings themselves can be streamlined and handled quickly and efficiently. If both parties choose, things can be settled in a way that doesn’t require months of drawn out legal proceedings, emotional battles, and expensive legal fees. We believe in the adage that “it is better to mediate than it is to litigate.” Meaning that things can be handled outside of the courts and much easier if both parties are willing to negotiate and agree to terms. If you or a loved one is considering divorce please contact us now to discuss your options and find out how CM Lawyers can be there to make sure that you are well represented. We specialize in making sure that our clients get their fair share while making sure that things run as smoothly as possible.